Shallots are a versatile member of the onion family, forming clumps of bulbs (offsets) in the same way as garlic. They are much milder than the onion and can be more easily eaten raw. Their leaves can also be eaten, like spring onions. There are yellow and red skinned forms all can be used fresh or stored for some time. Shallots are thought to have originated in Asia and taken to the eastern Mediterranean. 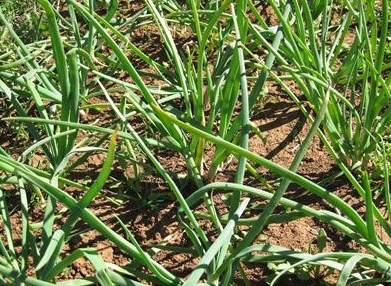 Climate, soil preparation, growing routines and pests are the same as for onions. Shallots are very hardy. Plant sets early in the spring or late winter in mild areas. As always, cultivate the soil well beforehand and incorporate well rotted compost. It is best to buy virus-free sets. Space sets 20cm apart in rows 20cm apart. Allow the tops of the sets to protrude from the soil, as the roots develop. Each set will develop offsets and a number can be held back each year for planting the following year. Harvest the green leaves as required. For larger bulbs, do not cut the leaves to allow the bulbs to grow to their full size. Lift the bulbs once the foliage has died down and let them dry. 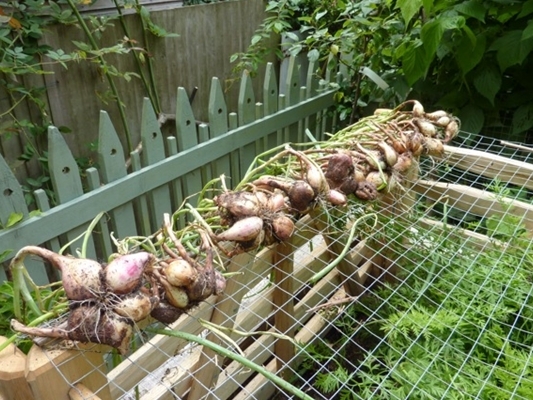 They can be stored in a cool dark place for some months, plaited in a rope just like onions or placed in an onion sack. Old stockings would also do. Shallots can also be sliced and frozen but lose some of their crunchy texture.